GE Aviation has started the 18-month certification program for the GE9X engine that will power the Boeing 777X. The first round of certification tests will take place in Peebles, Ohio. 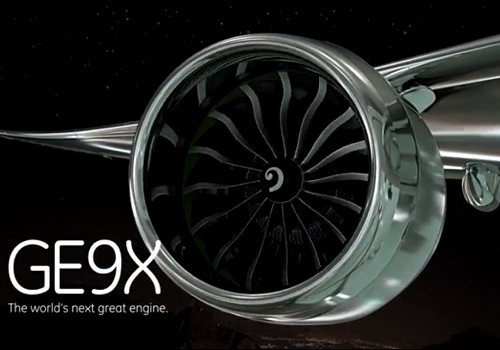 The certification testing is beginning on the second GE9X engine GE has built; ultimately, there will be eight certification test engines. The next two GE9X engines are currently being built. One of those two engines will be tested in flight on GE’s 747 flying testbed based in Victorville, California, in the second half of 2017. GE aims to complete the certification program by the end of 2018. The 777X is slated to enter service in 2020. The start of certification program follows more than a year of testing with the GE9X first engine to test (FETT). 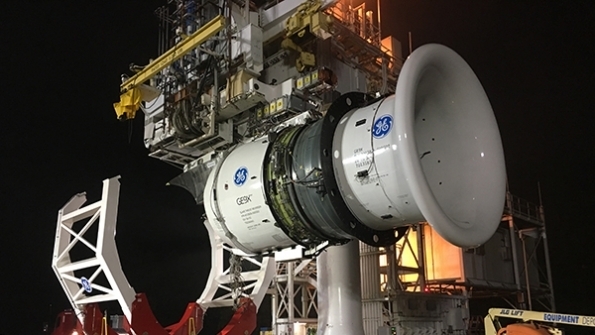 The second engine to test (SETT), which started for the first time on May 16, is the first GE9X certification engine and the first of a series to build to the full-up finalized production standard. SETT, also known as GE9X test engine 002/1, is the first to incorporate all the design changes from lessons learned during the validation runs of the first engine. In addition, GE will build an engine for ETOPS extended-range certification testing that will be configured with a Boeing-provided nacelle and other external hardware. From early 2018, GE will also deliver eight compliance engines, plus a pair of spares to Boeing for the four 777-9 flight-test aircraft. The Engine is now officially named the GE9X-105B1. The first of Airbus’ five new Beluga XL air lifters began to take shape, initiating the creation of a new jetliner fleet to transport complete sections of the company’s aircraft from production sites around Europe to final assembly lines in France, Germany and Spain. Beluga XL’s lower fuselage will be the same as the freighter version of the Airbus’ A330-200 jetliner and is to be built on the A330 final assembly line adjacent to Toulouse-Blagnac Airport in southwestern France. 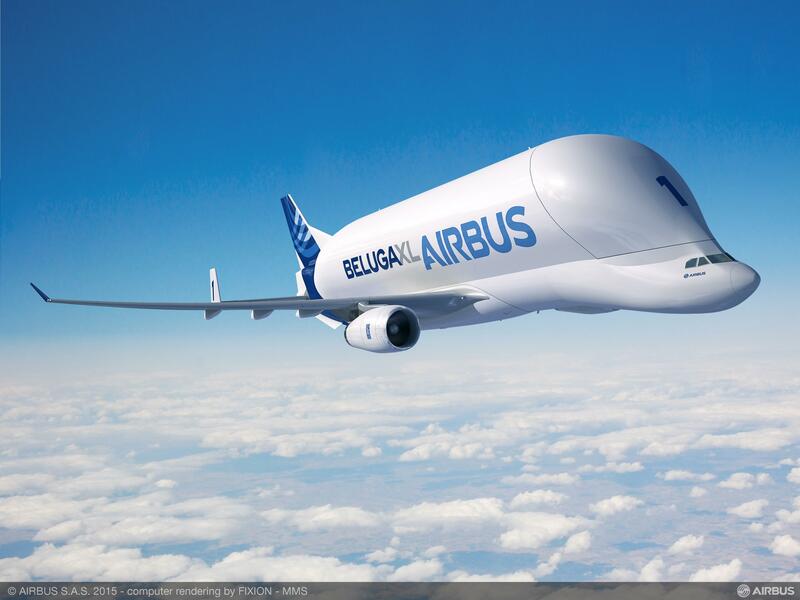 Airbus has taken delivery of the nose section for its first Beluga XL transport aircraft. The nose and cockpit have been constructed by Stelia Aerospace at a French facility in Meaulte. Stelia says several of its production sites, including its Tunisian facility, contributed to the manufacture. Airbus five Beluga XL twin jets will be powered by Rolls-Royce Trent 700 engines. 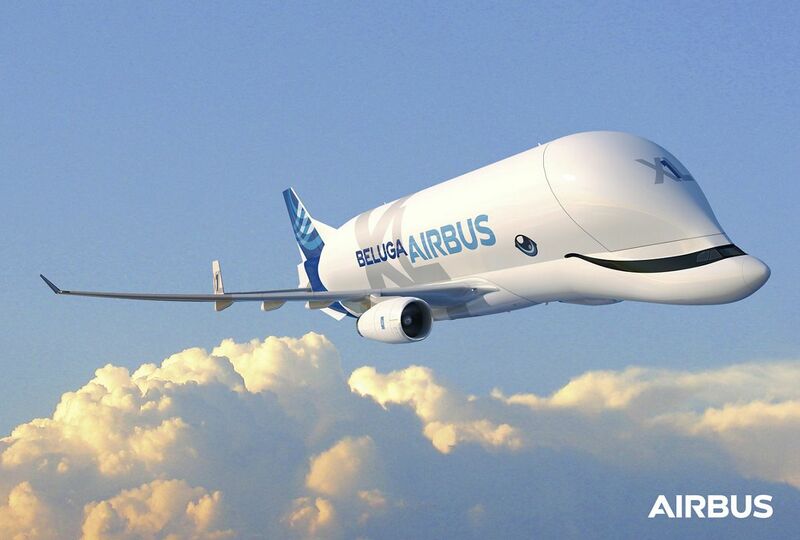 The airframer is to introduce a series of individual paint schemes for its forthcoming fleet of the five Beluga XL transports, with the lead example featuring an aquatic design based on the white whale the aircraft is named after. The first flight of the A330-200-based jet is due in 2018, Airbus confirms that each will bear a unique livery. The initial scheme was voted by employees, the airframe says. The Beluga XL will replace its fleet of A300-600ST outsized freighters from 2019. Deer Jet announced the building of world’s largest Dream Jet fleet by adding a second one to its managed fleet and brings to Seattle, the birthplace of Boeing, the world’s first 787 Dream Jet for its first display in the US. Exclusively for the Seattle exhibition, A collection of Sculptures from artist Dale Chihuly, including its famous Cylinders, created from glass-thread drawings on vessels inspired by Native American textiles, added local style to the 787 Dream Jet cabin. SACE (CDP Group) and Boeing have entered into an important agreement that will support Italian exports in the aeronautical sector in the form of new aircraft delivery financing. The agreement creates a shared platform for facilitating the financing of aircraft purchases of mutual interest each year, SACE will consider guaranteeing credit lines from third parties for the sale go Boeing aircraft (this year, up to 1.25 billion US dollars), in order to support Boeing’s contracts and subcontracts with Italian firms specialized in precision aeronautical components. SACE’s commitment will be evaluated every year and adjusted accordingly to the supplies that Boeing will allocate to Italian companies. “The agreement we are announcing strengthens our relationship with an international aerospace giant that has chosen Italy as one of its principal partners. Aeronautics has always been a strategic sector for our economy, where we can be even more incisive and more competitive in the international market”, said Alessandro Decio, CEO of Sace CDP Group. SACE said it will consider guaranteeing credit lines for airlines or leasing companies that buy Boeing aircraft. From 2015 to 2016, Boeing purchased 2.5 billion dollars of goods and services from Italian companies and, with a solid tie to the national economy, it has helped generate 12,000 jobs along the supply chain. United Airlines plans to introduce daily nonstop flights between Los Angeles and Singapore’s Changi Airport, effective October 27, subject to government approval. According to the Chicago-based carrier, the service will set the distance record for any airline operating a flight to or from the US, at 8,700 miles. (yet another milestone for the 787) Ed Kaplanian commented. 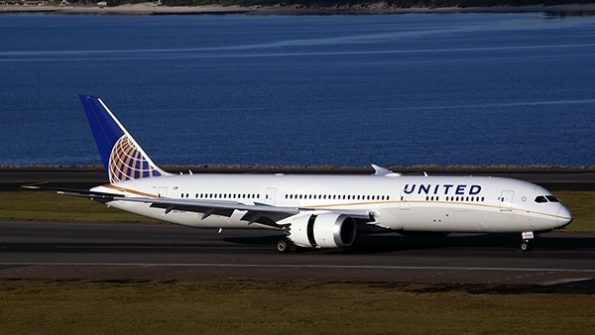 United’s existing service between San Francisco and Singapore started one year ago, June 1, 2016, and “holds the current record of the longest scheduled flight operated by any US carrier, at 8,446 miles,” the airline said in a statement. Both routes will use 252-seat Boeing 787-9s with 48 Polaris business class seats and 204 economy seats, including 88 economy plus seats. Flight UA 37 will depart Los Angeles at 8:55 p.m. daily, arriving in Singapore at 6:50 a.m. two days later (all times local). The return flight, UA 38, will depart Singapore Changi Airport at 11:00 a.m. daily, arriving at Los Angeles at 10:15 a.m. the same day. Flying times will be approximately 17 hours, 55 minutes westbound and 15 hours,15 minutes eastbound. HNA Group subsidiary, Hainan Airlines, is raising funds to acquire 13 Boeing 787-9s and six 738 MAX 8s. China’s Civil Aviation Authority has confirmed Hainan Airlines’ five year plan, paving the way for additional 19 aircraft. Under the strategy, the Haikou-based carrier will add seven Boeing 787-9s in 2018, followed by another six 787-9s and six 737 MAX 8s between January and August 2019. It currently has 10 787-8s and nine 787-9s in its fleet. Hainan Airlines valued the order at about $4.19 billion and detailed plans to raise the money through a bonds issue. The aircraft will be used to strategically grow its fleet and network, in a bid to boost profitability and competitiveness. According to the carrier’s website, its current fleet of 179 aircraft includes Airbus A330s, Boeing 737s, 767s, 787-8s and -9s. Iran Air has taken delivery of its first four ATR 72-600 turboprops. Earlier this year the carrier finalized a deal spanning 20 firm ATR 72-600s, plus options on another 20. Arkia Israeli leisure carrier has unveiled a vibrant new livery as it prepares to modernize its fleet. EgyptAir has taken delivery of the fourth of nine Boeing 737-800 NGs, as part of a fleet modernization plan and expansion strategy. Delta Air Lines placed an incremental order for 30 firm Airbus A321ceo aircraft. EasyJet UK budget carrier EasyJet has opted to take the Airbus A321neo,by converting orders for 30 of the smaller A320neo which the airline has on order. Kalitta Air took delivery of the first of two leased Boeing 747-400Fs from GECAS, adding capacity to Kalitta Air’s fleet of more than 15 wide body freighters. 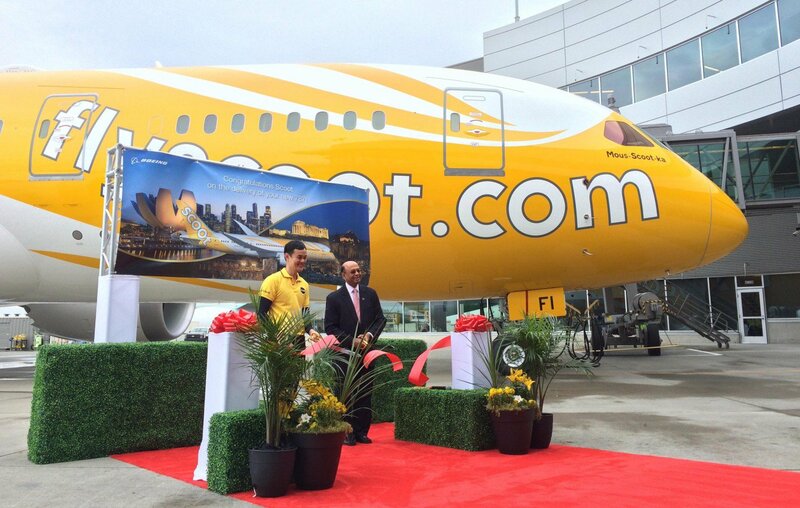 Scoot Singapore-based low-cost carrier received its 14th Boeing 787 Dreamliner at the Boeing Everett Delivery Center on May 12. Airbus’ is nearing a major change in its sales organization as its current head of sales, John Leahy, has indicated he will retire soon. 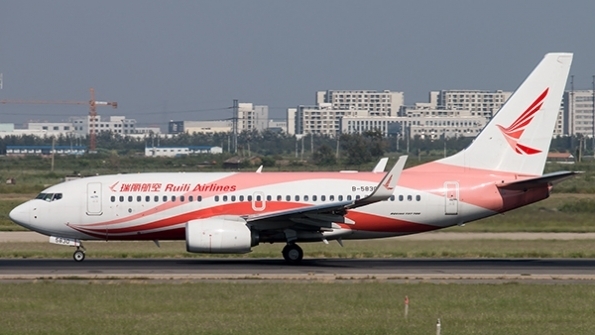 Ruili Airlines China’s low-cost (LCC) Ruili Airlines has agreed to lease three Boeing 737 MAX aircraft from AVIC International Leasing Co. in an effort to facilitate its international expansion. 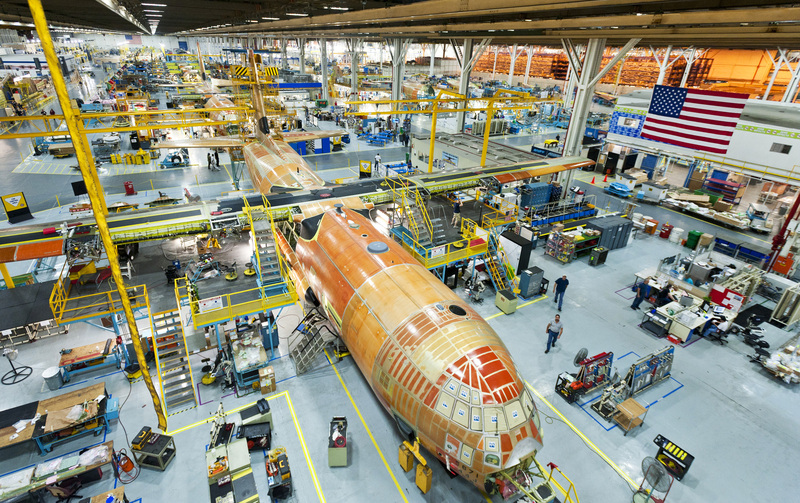 The first Lockheed Martin LM-100J commercial freighter aircraft achieved a critical milestone with the completion of its first flight in Marietta, Georgia. This flight followed the same test flight route over North Georgia and Alabama that is used for all C-130J Super Hercules aircraft. 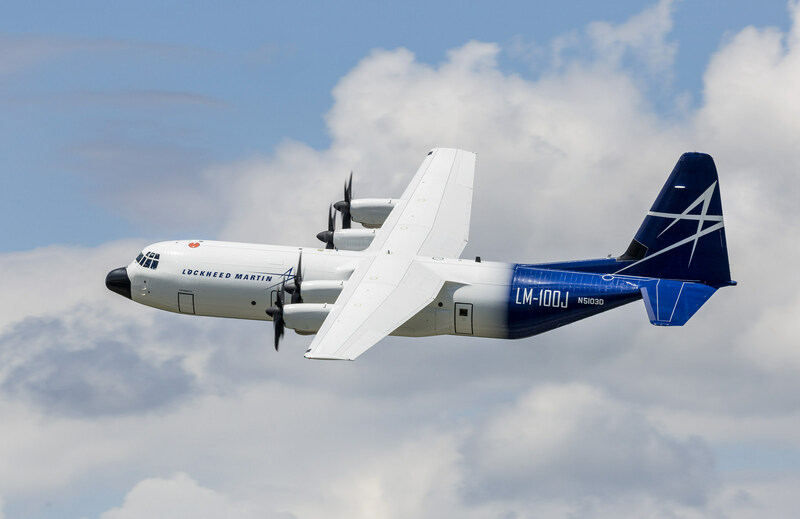 The LM-100J will complete initial production flight tests and then begin Federal Aviation Administration (FAA) type certificate update test requirements. Russia’s Airbridge Cargo carried 158.000 tons in 1Q 2017, up 17% year-over-Year, as a result of market growth and special products. 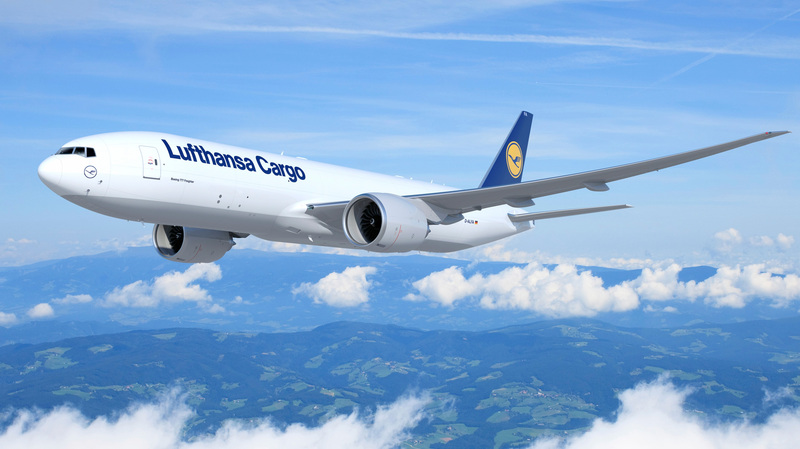 Load factor increased to 70% during the first months of the year, the carrier said in a statement on June 1. The largest Russian cargo airline, which is part of Volga-Dnepr Group, continued to develop its network in Asia, launching a new route to Taipei in April. ABC provides Boeing 747F services to and from Tokyo, Seoul, Singapore, Hanoi, Phnom Penh, Hong Kong, Shanghai, Beijing, Chengdu, Chongqing and Zhengzhou. According to ABC, high demand for exports from Europe enabled the airline to grow its tonnage from the region by 22% in Q1 2017; with growth on all its routes, notably to Asia, which recorded a 24% rise in tonnage over the same three months of 2016. ABC’s services from North America also continued to grow, the airline said, and now operates up to 30 flights a week on its routes serving Atlanta, Chicago, Houston, Los Angeles and Seattle. The arrival of the airline’s 10th new Boeing 747-8 F in March increased its total 747 fleet to 17 aircraft, contributed a 7% increase in frequencies network-wide. Australia’s Qantas Airways and its Jetstar Airways low-cost subsidiary have entered into a long-term component services agreement with AFI KLM E&M to cover its Boeing 787 fleet. 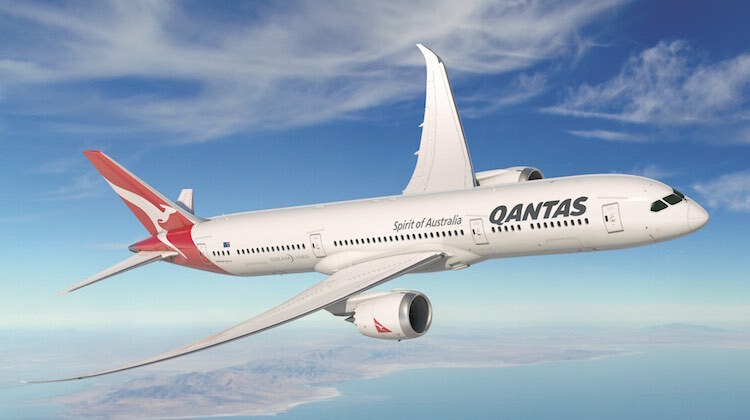 The contract covers pool access, repairs and applies to eight future Qantas-operated 787-9s. They are expected to start entering its fleet late this year and eleven 787-8 currently in service with Jetstar. AFI KLM E&M said the program aims to achieve maximum availability for supported fleet. It will see both airlines gain direct access to the aftermarket provider’s spare pool in Kuala Lumpur, with support from its global inventories and component repair shops. AFI KLM E&M said the total number of 787s under its parts coverage program now stands at 193 across 15 different airlines. Fabrice Defrance, senior vice president commercial AFI KLM E&M, said the new contract further strengthens its position in the Asia-Pacific region. It also grows ties with Qantas, as AFI KLM E&M already provides component support on its fleet of Airbus A330s and, through its Spairliners Subsidiary, coverage of its A380 fleet. Lufthansa Technik was selected by Madrid-based leisure carrier Wamos Air to provide Airbus A330 and Boeing component support. StandardAero was selected to maintain PW 125Bs for six Fokker 50s for Belgium carrier VLM Airlines. F&E Aircraft Maintenance expanded its GoldCare agreement with Boeing to provide 787 and 737 MAX line maintenance at Denver and Seattle. Aeronautical Engineers finalized contract with Mexico-based Aeronaves for sixth/Seventh MD-80 freighter conversions for late this year; Commercial Jet will modify one each at Miami and Dothan. SR Technics expanded its CFM56 component repair agreement with AerFin ,to include-5Bs and -7Bs in addition to -5Cs out of facilities in Zurich, Switzerland and Cork Ireland. HAECO was selected by Panasonic as an authorized IFEC repair center in China. Ameco delivered a converted Boeing 757 aircraft to China Postal Airlines. This is the sixth Boeing 757 aircraft delivered by Ameco Chengdu Branch since 2014, while another three 757s are in progress in its facility. Boeing and CFM International announced that they successfully initiated flight testing of the LEAP-1B engine on April 29th on GE’s modified 747 flying testbed at GE Aviation Flight Test Operations in Victorville, California. 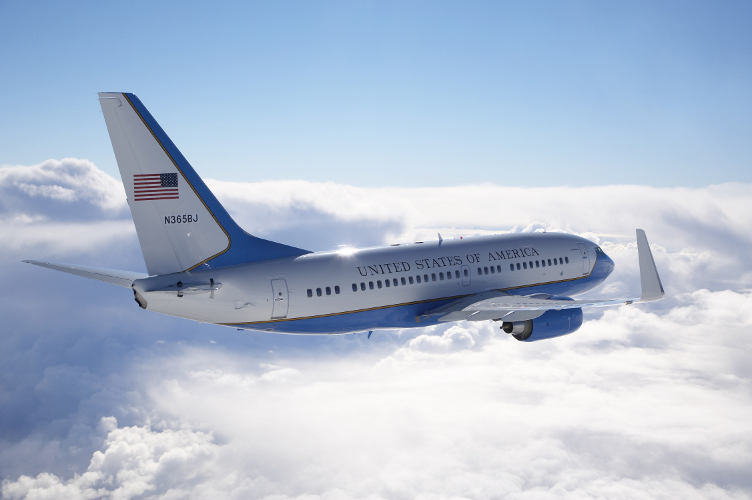 The testing is the next major milestone in a two-year program that will culminate in engine certification in 2016 and delivery of the first Boeing 737 MAX in 2017.The engine performed well and completed multiple aeromechanics test points of various altitudes during the five-hour 30 minute first flight. 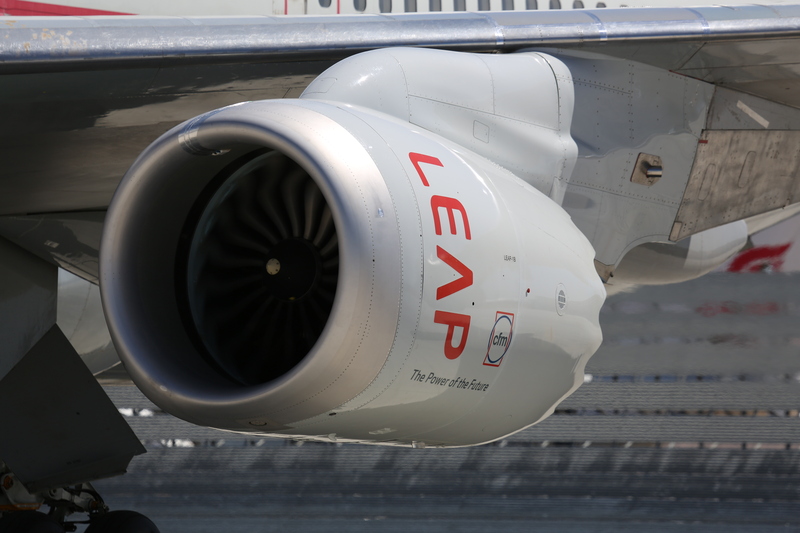 The LEAP-1B engine is the exclusive power plant for the Boeing 737 MAX family and is part of the most extensive ground and flight test certification program in CFM’s history. The first Leap-1B engine began ground testing on June 13, 2014, three days ahead of the schedule set when the program was launched in 2011. Over the next several weeks, the flight test program will encompass a comprehensive test schedule that will gauge engine operability, stall margin, performance, emissions and acoustics. To date, the 737 MAX has accumulated 2,724 orders from 57 customers worldwide. Airbus has selected Korean Air Aerospace Division, (KAL-ASD),the manufacturing division of Korean Air Group, to supply the new Sharklet wingtip for the A330neo. KAL-ASD will manufacture the new composite wingtip devices at its Busan facility and supply them to Airbus’s Toulouse final assembly line. The Sharklets bear a strong resemblance to the aerodynamic devices carried by the A350 and the A330 versions will include a wingspan extension; overall span will increase from 60.3m of the A330ceo to 64m on the A330neo and provide increased lift while reducing drag. 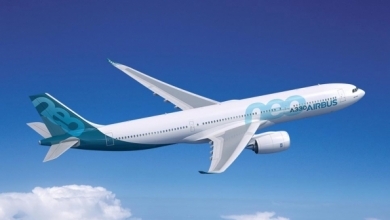 Together with the A330neo’s Rolls-Royce Trent 7000 engines, the new wingtips plus other aerodynamic enhancements will give the aircraft a 14% reduction in fuel burn per seat compared with today’s A330ceos,Airbus said. The first A330neos will be delivered in the fourth quarter of 2017. 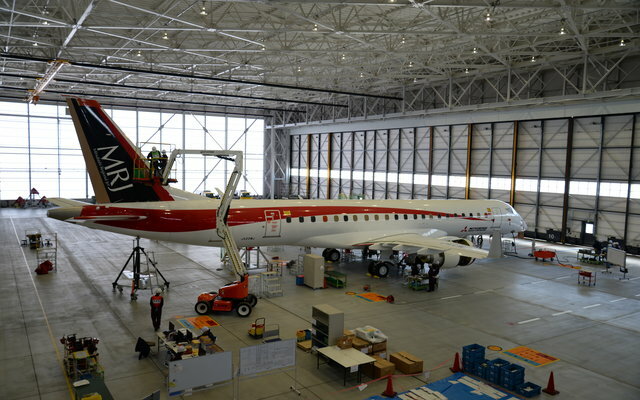 Mitsubishi Aircraft has released a series of photos of its fleet of five flight test aircraft for the MRJ regional jet program. The pictures show FTA-1, also known as MSN 10001, and FTA-2 having both completed final assembly and with its Pratt & Whitney engines attached. FTA-3 with its landing gear attached, has completed wing-to-body join although engines have not been mounted. FTA-4 is still resting on struts and undergoing wing-to-body join. The picture shows that its engines, horizontal stabilizers, rudder, flaps, ailerons and wingtips have also yet to be installed. The aft fuselage of FTA-5 meanwhile has not been fused. All five airframes have been painted, and FTA-5 appears to bear launch customer All Nippon Airway’ livery. 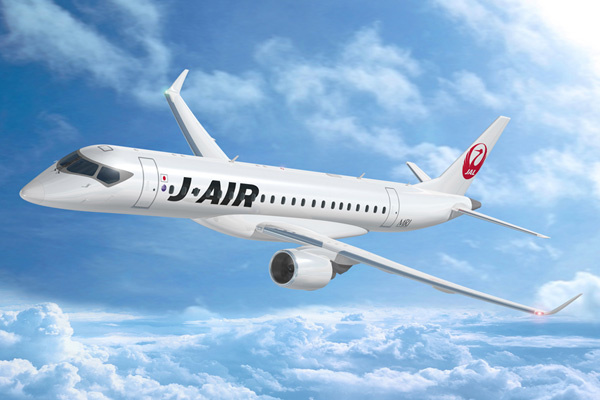 The Japanese airframe unveiled the pictures at the Regional Airline Association convention in Cleveland on May 12th. At the convention, it also announced that it has expanded planned flight test and engineering options in the USA with four more sites. Besides a flight test center in Moses Lake, Washington, an engineering center will also be opened in Seattle. It will also perform high-altitude flight tests at Gunnison Crested Butte Regional airport in Colorado, special runway tests at Roswell International Air Center in New Mexico, and use the McKinley climatic test cell at Eglin AFB, Florida. 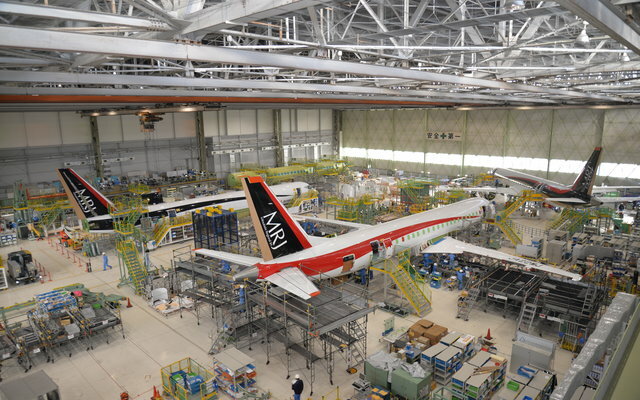 Mitsubishi has pushed the first flight of the MRJ to September or October of 2015,but committed to keep to its second quarter 2017 delivery schedule. Israel Aerospace Industries has launched a B737-700P2F (Passenger aircraft to Freighter) conversion program through its MRO and conversion arm, Bedek Aviation Group. According to Cargo Facts Alaska Airlines is the launch customer for the process with three firm orders plus one option. Bedek says that it expects certification to occur in mid 2016 with redelivery of the first converted aircraft due at the end of 2016. The US carrier’s cargo fleet currently consists of one B737-400F and four B737-400Ms used on flights throughout rural Alaska as well as to the mainland United States. Southwest Airlines Co. is expanding the number of flights it makes to Latin America and changing its order with the Boeing Co. for 31 of the company’s 737-700 jets to the larger 737-800. 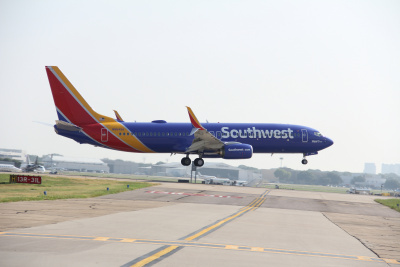 All 31 planes are scheduled for delivery to Southwest in 2016. The 737-800 includes 32 more seats than the 737-700 and carries a list price of $93.3 million compared with the list price of the $78.3 million for the smaller plane. Since placing its first order for the 727-200 in 1971, Southwest has ordered 941 new 737s from Boeing and taken delivery of 675. Southwest claims to have the largest fleet of Boeing airplanes in the world, with currently in active service according to planespotters.net. Of those, 440 are 737-700s and 95 737-800s. By the end of 2016 Southwest expects its fleet to number about 715 aircraft, all some version of the 737. For 2015, Southwest has 19 firm orders for the 737-800, and intends to take delivery of 19 pre-owned 737-700s. For 2016, the airline currently intends to take delivery of four pre-owned 737-700 aircraft. The airline also has more 737-700s on order for delivery in 2017 and 2018.Those orders may also be changed to 737-800s depending on the airline’s needs according to CEO Gary Kelly. The last 737-700 that Southwest acquired new was delivered in December 2011. TUI Group plans to rebrand its five airlines under a single “TUI” brand as part of its roadmap for growth initiative to be achieved by 2018. 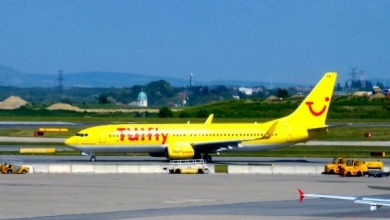 (Germany), Thomson Airways(UK), Arkefly (Netherlands), Jetairfly (Brussels) and TUIfly Nordic(Sweden). Each carrier will maintain its separate air operators certificate(AOC) and will remain responsible for its own crew and flight planning, but will operate under “one central organization.” Also, maintenance should be concentrated under one organization. According to a company statement, crew and fleet would be more efficient when switched between different bases and nations, depending on demand. This should increase effectiveness of the airlines. TUI hopes to deliver operational efficiency improvements worth $57 million per annum by 2018. TUI Group said the strategy generate more synergies by joining business units and would raise shareholders value. Eastern is back in business at Miami International Airport. The well-known carrier with the hockey stick logo resurrection of the airline that called Miami home for decades lifted off for its first revenue flight on May 28th.The destination for Eastern flight 3145 was Havana, in partnership with HavanaAir Charters. 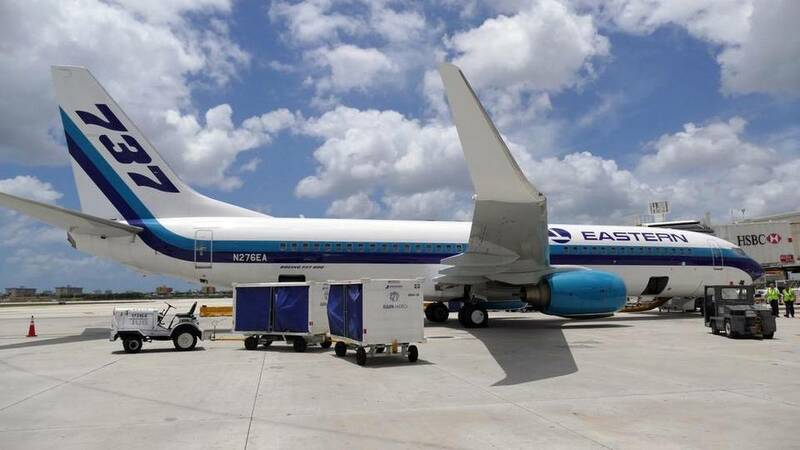 Eastern Air Lines announced last week that it had signed an agreement with Miami-based HavanaAir to provide lift for the operator’s charter flights to Havana, Santa Clara and Camaguey. The airline’s Boeing 737-800 will fly twice daily to Havana from Miami and weekly to other destinations, with plans to add service to Cuba from other gateway cities in the U.S. over the next couple months. Henry Harteveldt, travel industry analyst at Atmosphere Research in San Francisco, called the contract a “great win” for Eastern that will give the start operational experience, revenue and attention. “It’ll be good for Eastern in terms of giving it a lot of frequencies and it’s also a high-profile market,” Harteveldt said. ”It’s great visibility for the airline”. 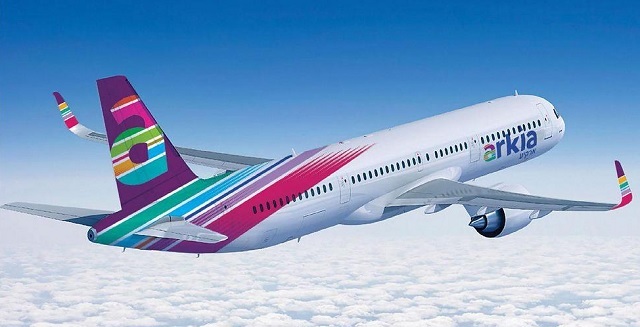 The earlier Eastern filed for bankruptcy protection in 1989 and stopped flying in 1991.The new airline is not affiliated with the original carrier but acquired its intellectual property; shareholders from the old airline also received rights to buy a stake in the new company. The company has set up shop at Miami International Airport’s Building 5A, the former Eastern operations center. 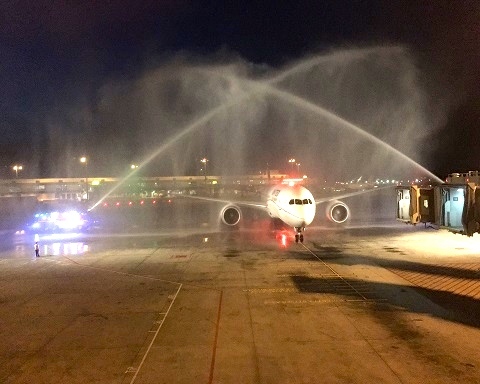 Community appreciation for the airline was evident in December, when the first aircraft arrived and crowds of politicians and former employees gathered to welcome it with cheers. 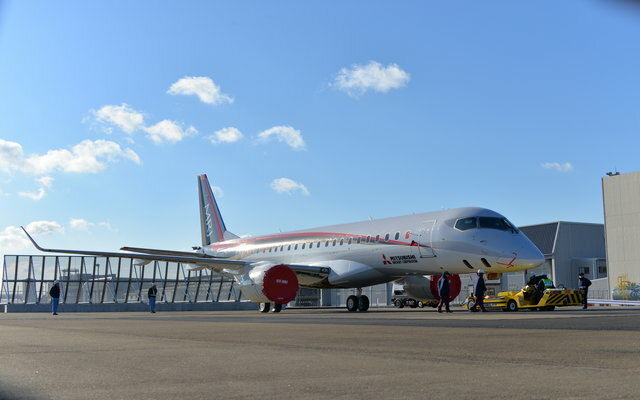 Azul Linhas Aereas have a final agreement for 30 firm orders for the E195-E2 jets. The contract, announced as a Letter of Intent (LOI) during the 2014 edition of the Farnborough International Airshow. HAECO Component Overhaul has been appointed by Umbra Cuscinetti as its exclusive provider of Authorized Repair Station services in mainland China. Pratt & Whitney has teamed with Bombardier to develop and implement a data management service for the CSeries, part of the Bombardier Aircraft Health Management System(AHMS) capable of transmitting real-time and recorded data from the aircraft. Turkish Airlines has taken delivery of the 125th Boeing aircraft-a Next Generation 737-900ER- one of 12 aircraft to be delivered to the Turkish flag carrier this year. Vietnam Airlines’ new 787-9 has rolled out of Boeing’s paint shop at Paine Field in its new livery.It is now undergoing preflight testing. 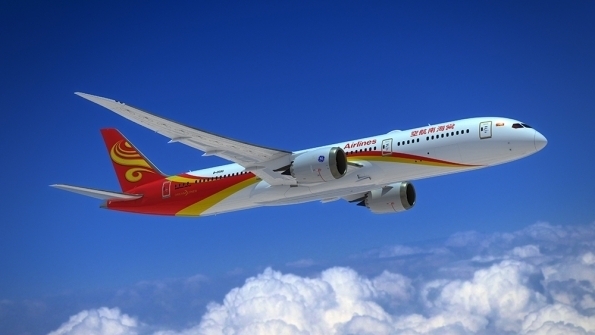 Hainan Airlines and Air lease Corp.(ALC) have inked a long-term lease agreement covering a pair of Boeing 787-9s.The aircraft will be sourced from ALC’s current order book, which comprises 46 787-9s and 787-10s due for delivery from spring 2016. Easy Jet has become the latest airline to commit to a higher-density Airbus A320 layout with the decision to fit 186 seats in the type. 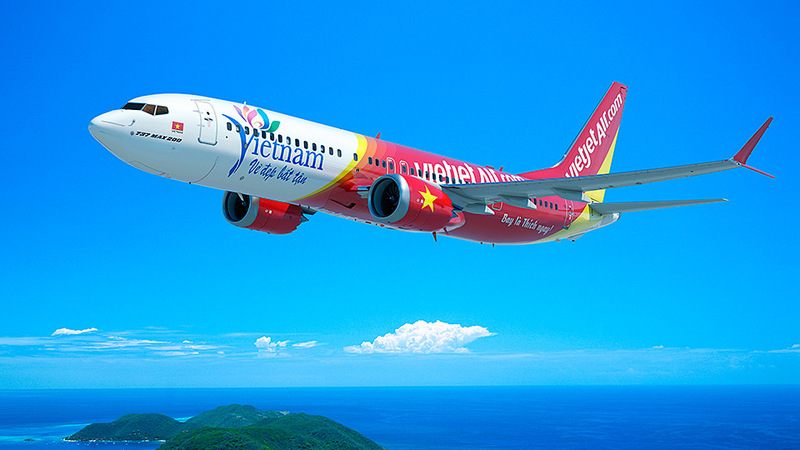 Ruili Airlines has signed an agreement with Minsheng Financial Leasing and AVIC Leasing for 60 Boeing Max aircraft. 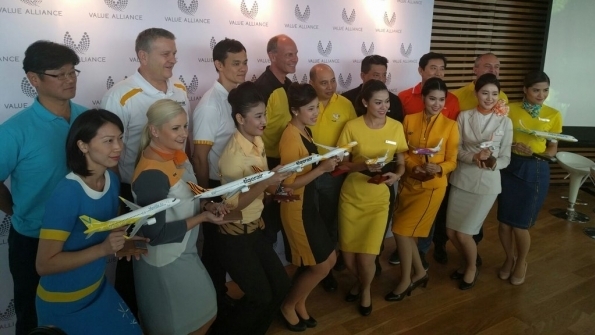 The agreement was signed on May 18th, which also marks the airline’s one year anniversary. Of the 60 jets, 30 will come from Minsheng and 30 from AVIC. Transaero On May 2nd Transaero took delivery of it’s Next Generation 737-800.The airplane was sporting a new livery. 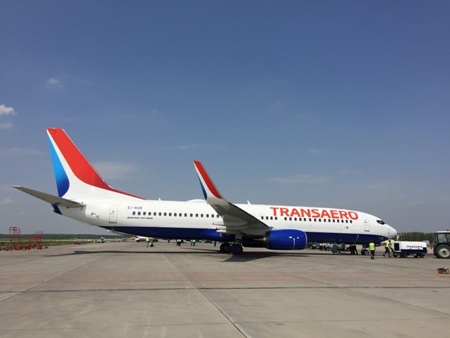 Transaero was the first private airline in Russia, established in 1991. 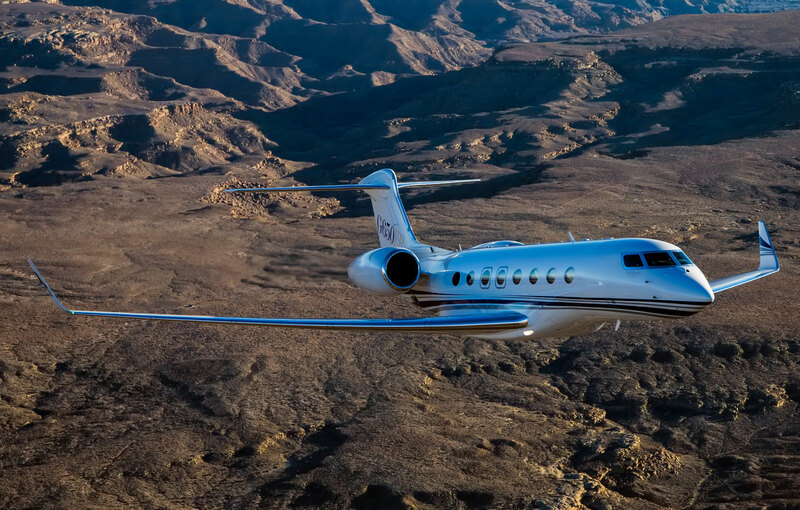 Qatar Executive has firmed up its earlier memorandum of understanding for 20 Gulfstream business jets and added an extra 10 aircraft to the order. 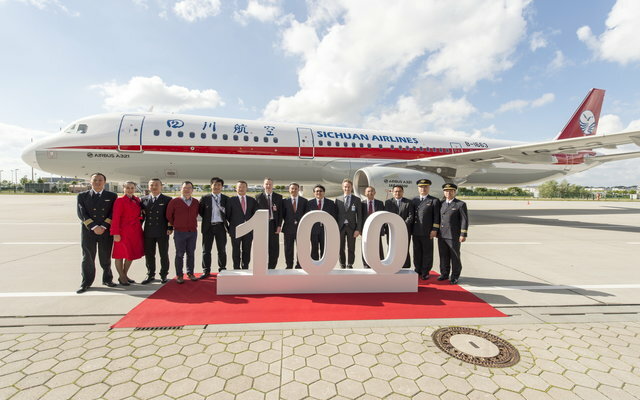 Sichuan Airlines has taken delivery of its 100th aircraft. The all-Airbus operator was handed over its latest jet, an A321, in Hamburg on May 22nd. Vietnam Airlines confirmed the first of its new Boeing 787-9 has completed its first B1 test flight The newly painted Dreamliner took off from Paine field in Everett. 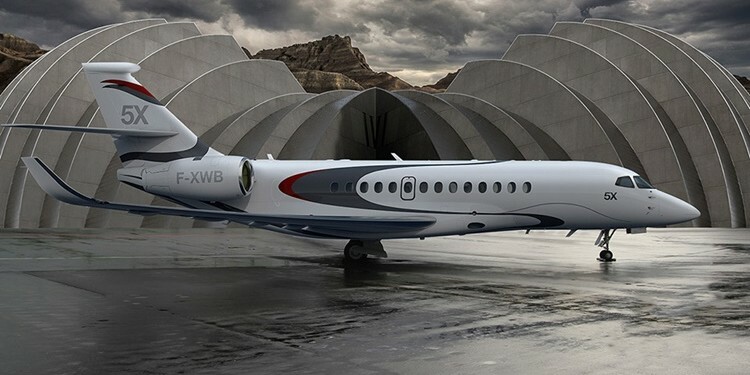 Dassault has rolled-out its falcon 5X at a ceremony at its 60-year old final assembly in Bordeaux-Merignac, southwest France. The ceremony took place on June 2nd. Nimgxia Cargo Airlines received preliminary approval from the Civil Aviation of China (CAAC) to conduct operations from its base at Yinchuan Hedong Airport in the Ningxia Autonomous Region,900 Km west of Beijing. 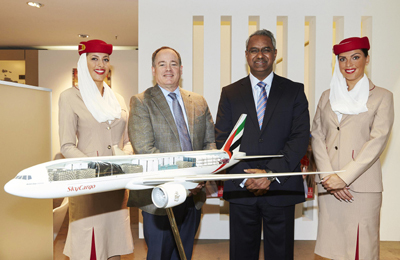 Emirates Sky Cargo to Start Service to Rickenbacker Columbus Regional Airport. Emirates SkyCargo, the freight division of Emirates airline, announced on May 27th that it will begin weekly cargo service to Rickenbacker Columbus Regional Airport. 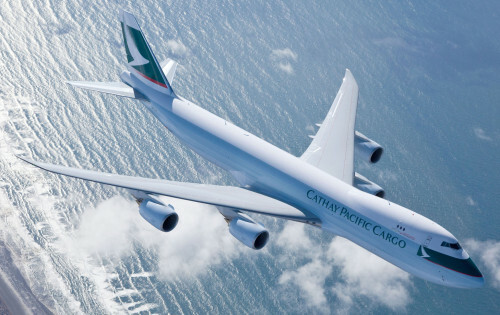 Fellow cargo companies Cargolux and Cathay Pacific currently fly from Hong Kong to Rickenbacker. Columbus is “an alternative port to Chicago, where shipments originating or destined to the Midwest can be trucked much more efficiently.” said Nabil Sultan, Emirates divisional senior vice president, Cargo, in a statement. Products expected to fly into Rickenbacker on Emirates flights include apparel, pharmaceuticals and electronics, but not all manufactured in the United Arab Emirates. Columbus is Emirates’ 48th destination for air cargo and sixth in the United States, according to the company. “The new service extends Ohio’s reach into critical market and provides yet another global asset that makes it easier and more profitable to do business within the Columbus region,” said Kenny McDonald, chief economic officer of Columbus 2020, in a statement. Heavy, outsized broadcasting equipment cargo from Tianjin, China, was delivered to Yerevan, Armenia, for television coverage of Armenia’s centenary commemorations .The equipment was a gift from the people of China to the people of Armenia. 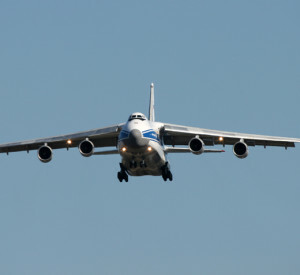 Air charter specialists Chapman Freeborn’s team in China commissioned the flight and chose to work with Ruslan International, which was formed through a joint venture between Antonov Airline and Volga-Dnepr Airlines. 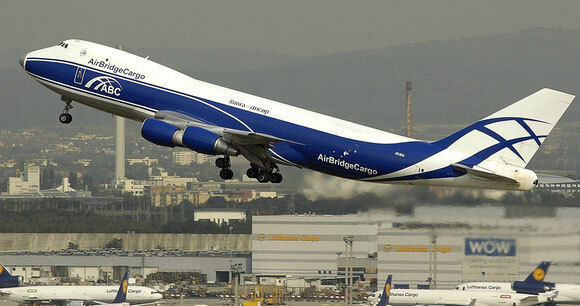 The carrier specializes in outsize and heavy cargo, employing a fleet of 17 Antonov An124-100 aircraft. The 40 tons of cargo in this shipment consisted of three outside broadcast equipment including a large generator. The height of one of the vehicles was a challenge, but with the use of special flat extension ramp it was loaded smoothly. “All the loads we carry are important, but this cargo has particular significance due to its role in helping the people of Armenia commemorate the centenary of such a defining moment in their history,” said Alexander Kraynow of Ruslan International.